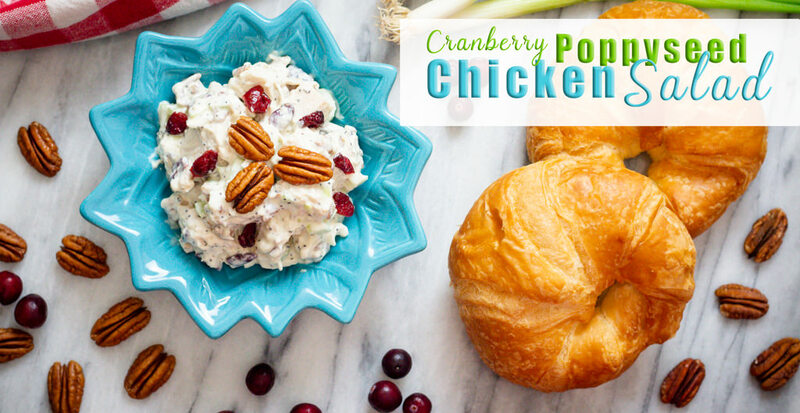 Cranberry Chicken Salad with pecans in a creamy poppyseed dressing is delicious and a wonderful appetizer served with crackers or as a meal served on a buttery croissant. 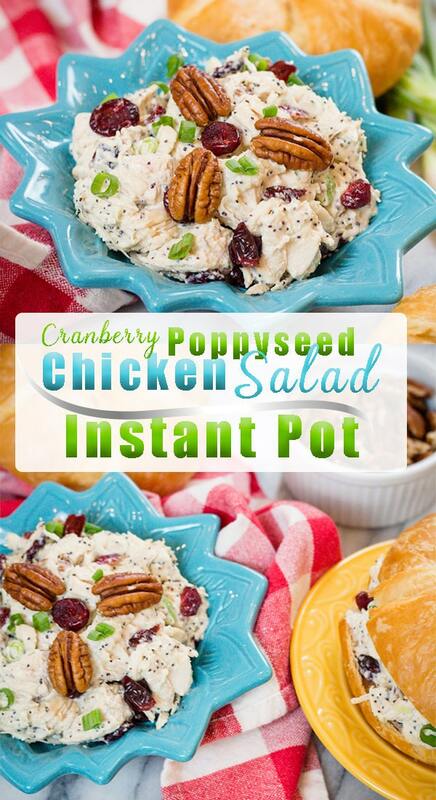 Easy Chicken Salad Recipe really is easy and it’s delicious too. I’m a sucker for “easy” recipes and this Easy Chicken Salad Recipe is definitely easy from beginning to end. On top of that, it’s just down right delicious. You really can’t go wrong. I love this as a lunch or dinner meal, but I also enjoy this Chicken Salad with herb Ritz Crackers too. The crunch and flavor combo is out of this world. 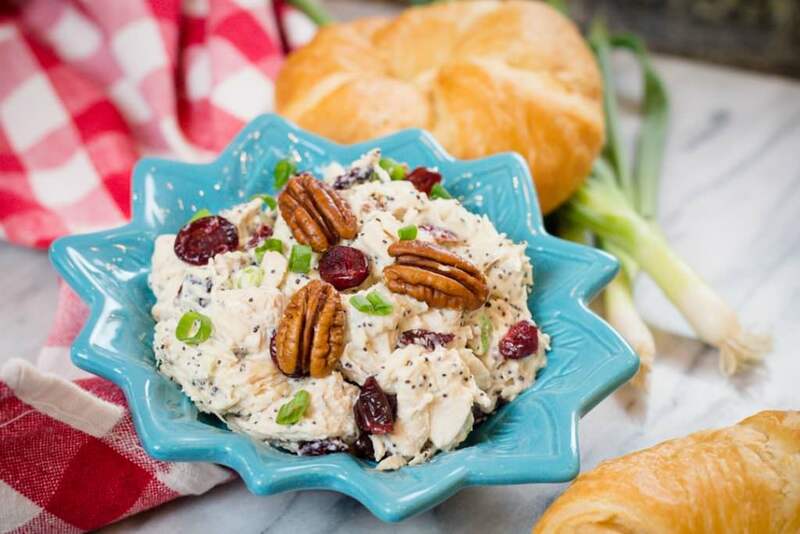 I make a number of Chicken Salad Recipes that each have their own flavors and reasons why I love them. 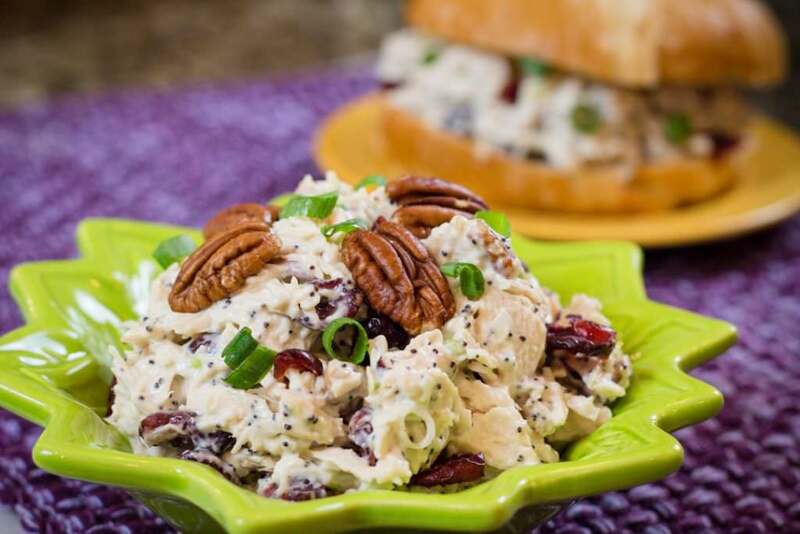 This Easy Chicken Salad Recipe I enjoy for the texture and flavors when all combined. It’s a party in your mouth, literally. 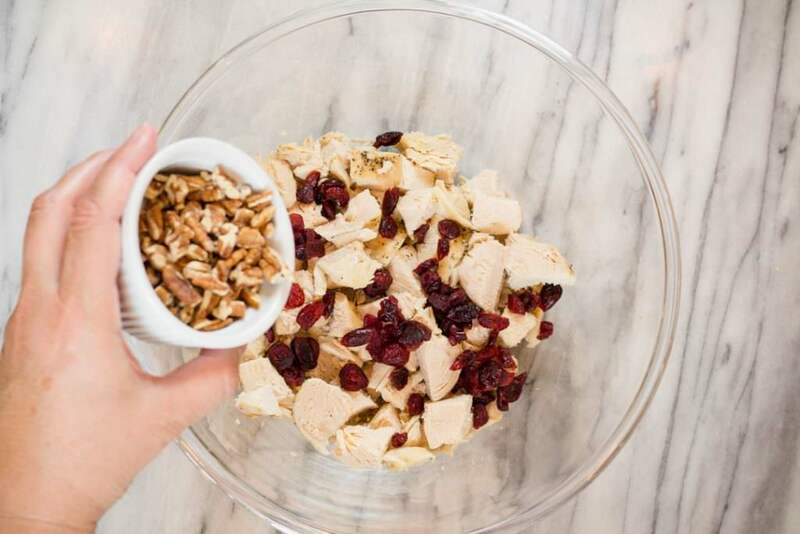 With large chunks of chicken, and sweet cranberries you can get a taste of sweet and savory in each bite… and let’s not forget the crunch from Pecans. Oh how I love pecans. One of the many reasons why this easy chicken salad becomes a party in my mouth. Making your chicken for this easy recipe in the Instant Pot or pressure cooker is a breeze and so helpful for this recipe. However, it’s not the only way you can make it. Chicken can be cooked in a crock pot or even on the stove. It’s really up to what you have and how long you want to take. 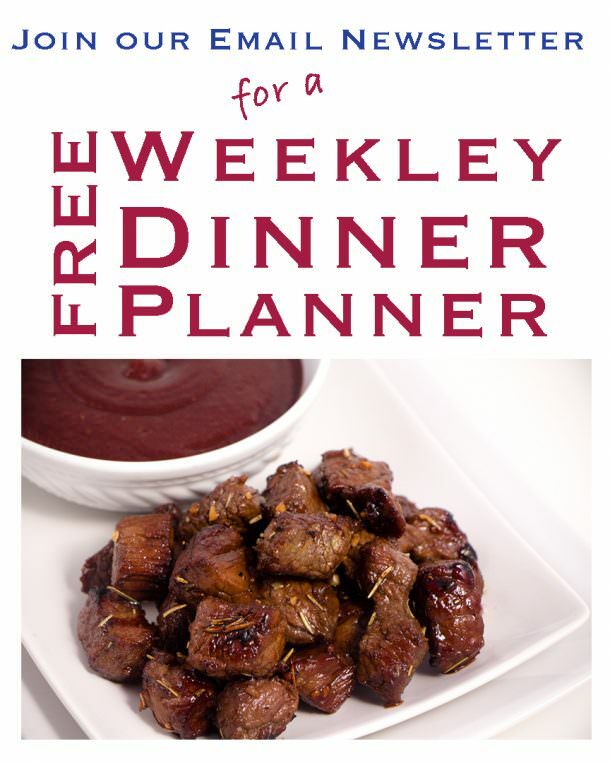 Time will vary of course, but that shouldn’t detour you from giving this recipe a try. It really comes together with little effort as most of the time spent is allowing the chicken breasts to cool so you can cut it without the chicken shredding. Anyone who has ever traveled with me, knows that Chicken Salad is packed somewhere for along the way. I find, unfortunately, when I take trips that my stomach doesn’t appreciate all the fast food. So I have learned to solve that by packing great snacks and meals other than traditional PB&J sandwiches. 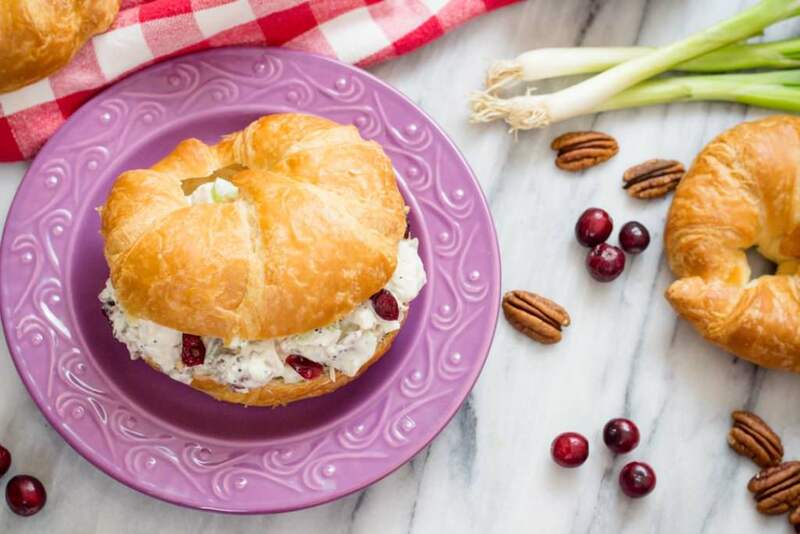 Many of times the “Party Wagon” filled with young adults has been pleasantly surprised at a gas stop with beautiful chicken salad sandwiches on croissants. Chicken Salad is a mixture of chicken, often times with onions, celery and a Mayonnaise base sauce mixed to combine it all. Variations will include nuts and often time fruits. The combinations are wonderful and so delicious. How to Eat Chicken Salad? Chicken Salad can be eaten plain and is really good. I enjoy eating Chicken Salad with Ritz crackers as a light meal or appetizer. Serve Chicken Salad on a bread or roll, we really like a buttery croissant which adds the perfect flavors and textures. There isn’t a bad way to eat Chicken Salad. Is Chicken Salad Gluten Free? Yes, it can be. Certainly the chicken, pecans and cranberries are gluten free. 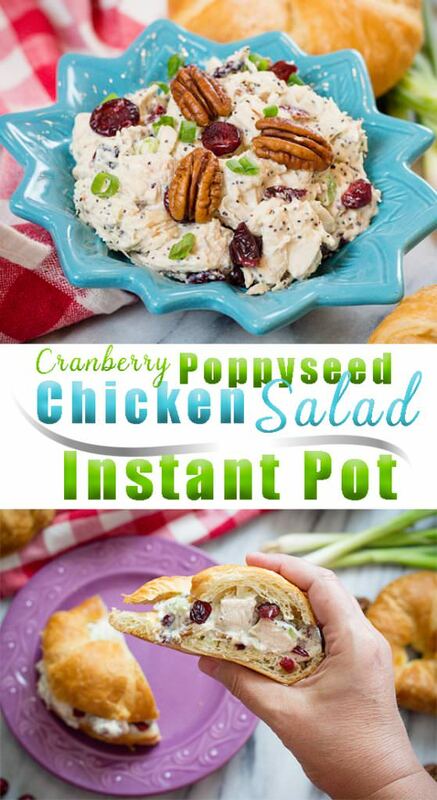 Make sure to choose a Gluten Free Poppy Seed Dressing for this recipes and you are good to go. Serve with gluten free bread or crackers. Delish! Can Chicken Salad be made a day ahead? I actually prefer it made a day ahead, Somehow all the flavors meld together and it’s wonderful. But don’t get me wrong, I also am eating Easy Chicken Salad right up as I’m making it because I love the sweet cranberries and textures. Mmmm. Wait to cut your chicken until it’s cold. Cold Cooked Chicken will cube and hold together so much better. When Chicken is warm and cut it tends to fall apart. Of course it doesn’t matter if your chicken stays cubed or shreds. The flavor is all the same. Cook your Chicken. Chicken can be cooked in your Instant Pot, Crock Pot or on the stove. See full directions in recipe card below. Allow chicken to cool. Place in the refrigerator. Cut up green onions, celery, and chop pecans. Cut cold Chicken into cubes and place in a medium bowl. Add diced green onions, pecans, celery and cranberries. Toss to combine. Add Poppyseed Dressing and stir to combine. Add salt and pepper to taste. Serve with crackers, on a croissant roll or bread. Perfect Lunch, appetizer or dinner. 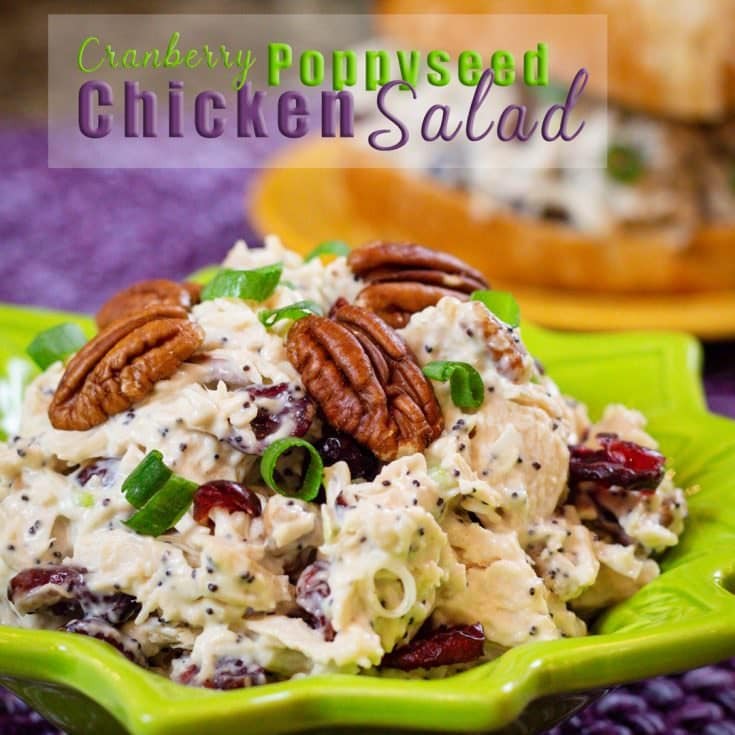 Easy Chicken Salad made with Pecans and Cranberries in a creamy Poppyseed Dressing. It's really that easy and delicious. Place chicken breasts in Instant Pot. Salt and Pepper chicken. Add Garlic. Add 1 cup water or broth. Set to Manual for 18 minutes. Allow 10 minute Natural Release and then quick release. Remove from Instant Pot and place in Refrigerator to cool. Wash and cut Celery and set aside. Dice Green Onions and set aside. Cube cold cooked chicken and place in medium size bowl. Add celery, green onions, cranberries and chopped pecans. Toss to combine. Serve with crackers or on bread. Crock Pot: Chicken can also be cooked in your Crock Pot on low for 6 hours and then cooled. Place chicken in crock pot with salt, pepper and garlic. Cook for 6 hours on low. Remove and place in refrigerator and resume with step #2. Stove: Chicken can be cooked on stove in a sauce pan over medium heat. Add 2 cups liquid, we prefer chicken broth, salt, pepper and garlic and add chicken. Cover with lid and allow to cook. Depending on heat, chicken will take 30-45 minutes. Use a digital thermometer to check internal temperature which should be 165 degrees. Waiting until the chicken is cold to cut helps keep the chicken in a cube. Warm chicken tends to flake and shred. However it won't matter if the chicken is cubed or shredded. The recipe will taste the same.